Teaching in the UK is a great job and one perk to working in state education is the free time in the summer. Through family and friends, I was put in contact with Care Sri Lanka to enquire about working for them for a few weeks. After booking flights, my eager planning still failed to paint a full picture of what to expect and I headed for Colombo in July with little more than an address and a photo of Ambrose who was to pick me up. One thing I have learnt this summer is that God really does have a plan and will guide us. Sri Lanka is unlike any place I have visited, with its busy roads, dense palm trees and impressive heat. The colour and vibrancy of Sri Lanka hits you the moment you step out of the airport and I had a front row seat to near-misses with dogs, painted lorries and families of five astride a single moped. I was privileged to see a lot of the country; whilst the coastal areas are sandy, tropical and dusty, the higher country stunned me with the rolling tea plantations and clouded peaks. Temples, churches and mosques are dotted along roads as contrasting as the change between coastal sand and rocky mountains. The food has changed curries for me forever; aubergines, spices and fish cooked in so many ways that curry for breakfast, lunch and dinner becomes a treat, and fresh fruit that makes my mouth water even now. I have stayed with families all over the world, but no-one made me feel as welcome as the people I met in Sri Lanka. Travelling as a woman in my twenties and alone, I had concerns, but as soon as I arrived in busy Colombo, Jeyakanth and Vani made it clear I could rely on the people I would meet. The pastors who showed me around their churches and the members I shared lunch with taught me much about their own lives and the growth of their faith; testimonies that demonstrate the grace of God in so many seemingly impossible situations. It is often said that Christians around the world are our brothers and sisters in Christ, and I have never felt this to be more real, as pastors and families invited me to eat with them, work alongside them and share many a good joke! Before the trip, I found it hard to get a realistic idea of how the work Jeyakanth coordinates in Sri Lanka is lived out day by day. Yes, I did my research and read the newsletters, but I didn’t grasp the scope of what is actually happening. 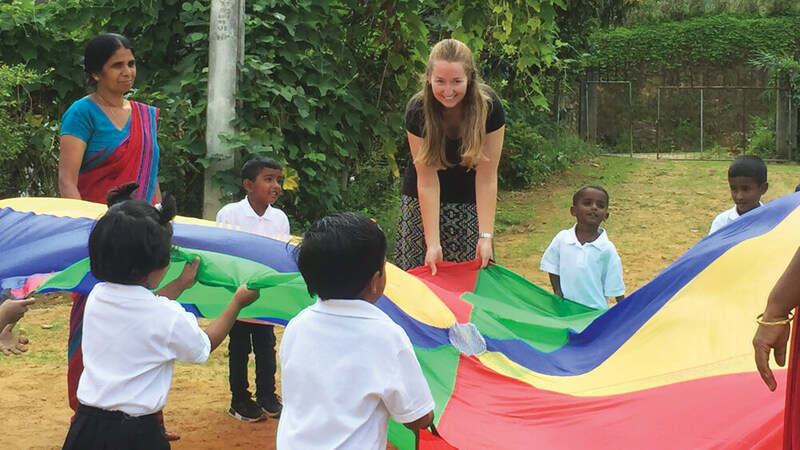 I was incredibly blessed to be sent all over Sri Lanka to see pre-schools, churches, and food programmes and to teach at many of these; I witnessed how honest people in their communities carried out the work. I spent a few days at 6th Mile Post Children’s Home and taught the girls and boys some basic wood working skills in a small, outdoor workshop. I demonstrated some simple joinery with the tools and materials available; thankfully the only cut hand was my own! With school during the day, tuition after lunch and my class after that, I was impressed by the focus of the children and their enthusiasm to practise a new skill. One evening I returned to Jeyakanth’s home to find a large team of pastors and helpers packing up food parcels. 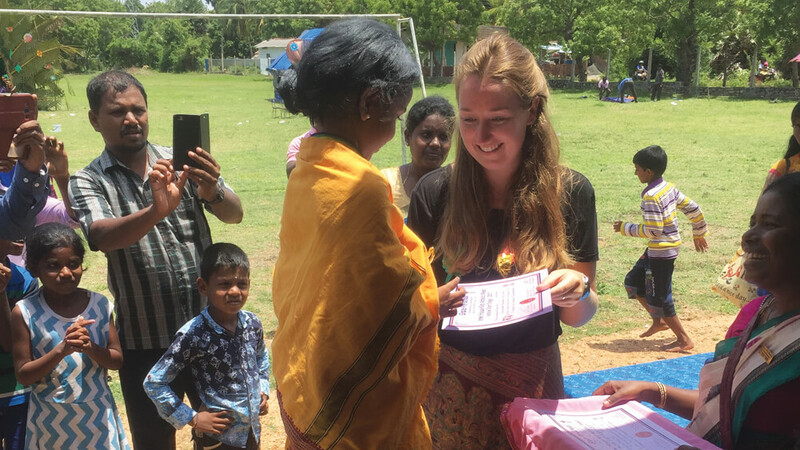 Working for hours, we weighed and bagged lentils, flour, sugar, soya beans, tea and rice to send out to Muthur – an area badly affected by the drought. There were small and large parcels for families of different sizes and all were loaded into vans to distribute through the churches. I went back to South Muthur the following day and after a sermon from Pastor Jeyakanth it was a privilege to give out some of these food gifts to people in need. Not only are pastors growing church congregations, but they are also serving and providing practical help to people in need, such as food for people with not enough due to the drought, or wells for villages with little access to reliable water supplies. I helped teach the children and saw the baptism of 25 people in the sea one Saturday; something that really showed me the authenticity of how faith is changing peoples’ lives in dramatic ways. It was difficult to know exactly what I could bring to such extensive work, but I found that through teaching some basic carpentry, English and pre-school sessions not only did I meet some amazing children, but I myself was also inspired by the commitment of others to learn and work hard. I had a taster of many aspects of the Care Sri Lanka network and look to going back with a more specific focus in the future. My solo trip to work in Sri Lanka was not exactly as I expected, but then who could prepare you for such a varied and engaging experience? I was challenged as a teacher and as a person, and have returned to the UK with an insight that I would never have achieved ‘hostel-hopping’ or chilling on the beach. The people I have worked alongside, who have hosted me and given up time for me, will continue to inspire me in my own work, prayers and outlook.